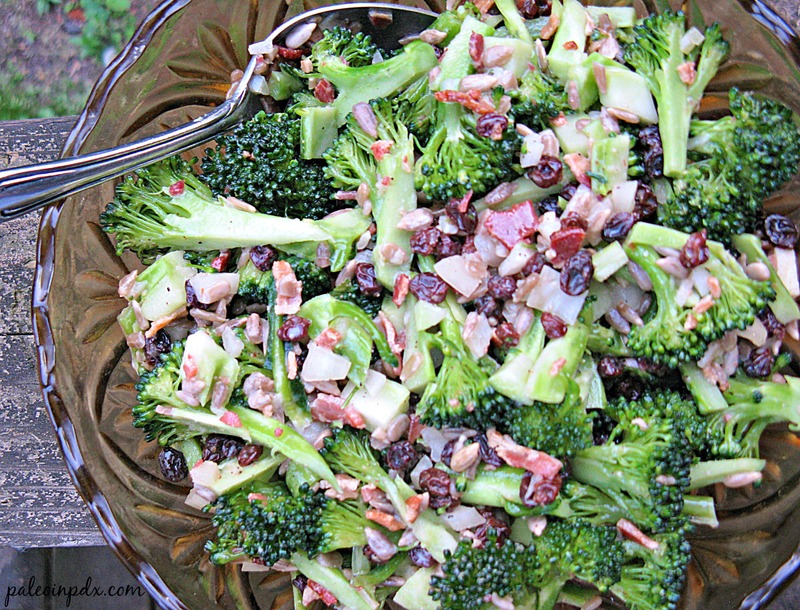 Does anyone remember eating the broccoli salad that had bacon, raisins, sunflower seeds and a creamy, slightly sweet mayo dressing? It often made an appearance at our family gatherings when I was growing up and more often than not, I enjoyed it. I think nearly every mom in my hometown had the recipe too. I don’t know if it was shared at PTA meetings or in elementary school cookbooks, but so many women made it at social gatherings. I kid you not! Anyway, I got to thinking about the salad recently because I had a bunch of broccoli in my refrigerator that needed to be used up, pronto. I didn’t have any mayo made and really wasn’t feeling a mayo-based dressing anyway, so revamped it as a slightly creamy vinaigrette. It turned out very well and I was surprised how much it tasted like the original salad. Honestly, I think it’s the bacon, sunflower seeds and raisins (or in my recipe, currants) that really make the salad taste the way it does. For those of you that remember the salad I’m referring to, see for yourself. 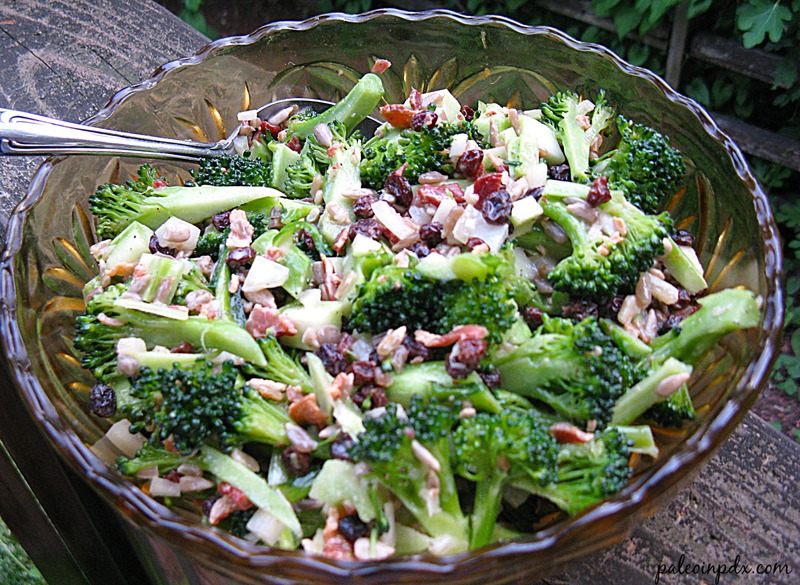 In a large bowl, mix together the broccoli, onion, bacon, currants and sunflower seeds. In a separate small bowl, whisk together the apple cider vinegar, olive oil, coconut milk, raw honey, mustard powder, sea salt and pepper. Pour dressing over mixture and stir well. Refrigerate at least 6-8 hours or overnight. Pull out of the fridge about 10 minutes before serving, to allow dressing to soften (it firms up in the fridge since it’s an olive oil based dressing). Enjoy with burgers, grilled chicken, steak, fish, etc. Anything really! Yum! We have some elderly broccoli in the fridge that could make itself useful. This looks delicious – bookmarked! Thanks! It’s a really great way to use up broccoli in a pinch…and you don’t even need to cook it! First, this salad looks SO yummy! It looks like the perfect summer salad. Second, I have been unusually busy lately as well. I feel like I could have writen this sentence — “I know it will all come together, and even though it’s going to be a bit stressful and chaotic, it will be fine” I repeat something like that to myself a few times a day lately — and I’m not even planning a wedding! Thanks for taking the time to post and update your blog, even through this busy time. Thank you for your kind note, MC. It makes me feel better and appreciated too! This looks so good!! Great post. I have never had this brought to a party but I know Ruby Tuesday’s has it on their salad bar. I don’t eat out often but whenever I used to go out to there I would also get it. This looks WAY better! Ha, thanks! I’d like to think it’s a lot better than Ruby Tuesday’s…who knows what all goes in theirs! Does it have a coconut flavor from the coconut milk? No, it’s such a small amount that coconut flavor is not noticeable. You could also use almond milk if you prefer. How many cups is one head broccoli? Probably about 2-3 cups. I just used one large sized head of broccoli and the stem. I wouldn’t worry about exact cups.